In May 2012, Roots Ethiopia visited Hadiya, Kembata, and Tembaro zones to evaluate our programs with Meseret Kristos Church (MKC). We visited Hosanna, Doyogena, Hadero, and Shinshecho church headquarters. During our meetings, in every case, when we asked church leaders to share their concerns about needs in the area, the overwhelming response was hunger. Hunger impacts so many people in Ethiopia, especially during the time when late rains delay the season’s harvest. Experts suggested that this year the late start of the rain meant the early July harvest would be delayed until late August and early September. Called ‘green hunger’, this time is particularly difficult for the very young, the very old, and anyone suffering from both chronic and acute illnesses. Hunger impacts everything and everyone. This information put Roots Ethiopia’s Grain Crew 2012 into action. Roots Ethiopia raised $5,156.14 USD in funds for MKC to plan and distribute grains to the neediest and most vulnerable families in their communities. Funds were sent in early June—our donors were quick and compassionate responders! The grain distribution was completed at five locations in early July. 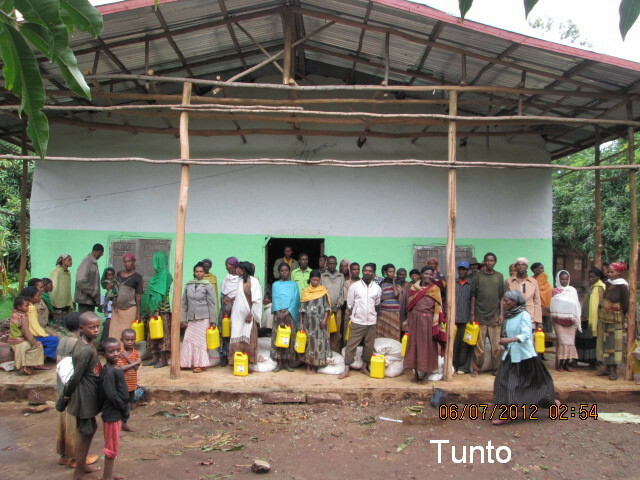 The locations of distribution were Shinshecho, Hadero, Tunto, Bonosha and Gimbichu. MKC church staff supplied 165 families with enough food to last six weeks per family. The supplies included 50 kilograms of maize, three liters of cooking oil and some produce. The food supply was calculated to last through August, when the harvest is estimated to occur and when additional food resources will be available to families in the region. Through their ongoing community service in the region, MKC was able to identify the most vulnerable families in the region. Largely, they were women-led households and particularly households without any land to farm. Roots Ethiopia celebrates Grain Crew 2012 as a great success. Our work is work that is well worth doing.